It’s time! My sixth anniversary here passed last weekend and, as promised, I’m here with a giveaway to celebrate. It was fun collecting the giveaway items, but I had some unexpected struggles along the way. I fell in love with the feather print, but wandered around the fabric store, unable put together the coordinating prints in a way that made me happy. My husband had tagged along, and was quietly messing around with his phone until I looked at him and said “Help me?” He started reaching for fabrics and throwing them in the cart, then I filled in the blanks until we had the collection you see here. He even grabbed the adorable wood buttons and said “Hey, these would go with those fabrics!” I’m sorry ladies, but he is SO taken. Each of these fabrics is a half-yard piece, so there’s a total of 3 yards here. That should give you lots of options for ways to use it! I’ve included a pair of my favorite clippers. I have three pairs of these, strategically placed anywhere I think I might need them. 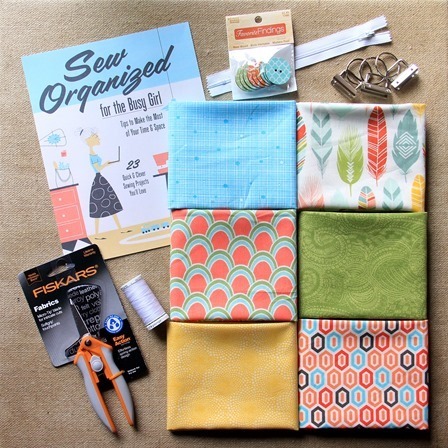 I’m also throwing in this book, Sew Organized for the Busy Girl: Tips to Make the Most of Your Time & Space 23 Quick & Clever Sewing Projects You'll Love . I haven’t read it yet, but I LOVE the cover art! Doesn’t everyone choose their sewing books that way? These are those buttons I mentioned before. I’m also throwing in a spool of my favorite white thread, a 7” white zipper and some hardware to make key fobs. In fact, check back here next week for a tutorial on those! 1st entry: Leave a comment telling me a little about the last thing you made. No limits on this. If you want to talk about the awesome sandwich you made for lunch yesterday, let that flag fly. 2nd entry: Follow me on Facebook, Pinterest, Instagram or email (right sidebar). Leave a second comment here letting me know. If you were already following me somewhere just leave a comment telling me so (you don’t need to follow somewhere else just to enter). This giveaway opens on February 17, 2016 and will remain open for entries until midnight Pacific Time on February 24, 2016. I will email the randomly selected winner on February 25th.